This isn’t about 3D printers, but it’s about something that was made with a 3D printer. Could it have been created without one? Sure. And, in fact, many other similar pieces have been put together by its creator, Tobias Krawutschke — without a 3D printer. However, in no way could he have created it as quickly or precisely. But, here’s the main thing is this: I just think it’s incredibly cool and want to share the video of it with you. What you see in the video is a Zoetrope, which is a device that produces the illusion of motion from a rapid succession of static pictures. You may have seen replicas of some of the original ones from way back when that consist of a cylinder with slits cut vertically in the sides, through which one sees the images painted inside through the slits. (More on it at Wikipedia if you are interested.) In the case of Tobias’ 3D-printed Zoetrope he named 3Drehkino, an LED strobelight is triggered by each passing figure in its appropriate pose, flashing the strobe on it at the right time to give it the extremely realistic illusion of motion. 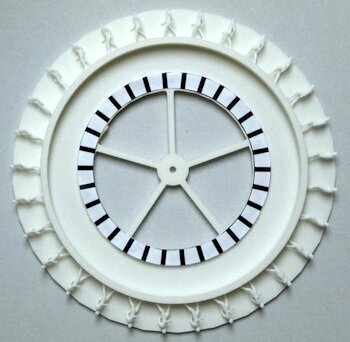 This is what the 3D wheel, printed by Shapeways, looks like when not spinning and with no strobe light. As is common with the very generous and sharing, creator and arts communities, Tobias shares his “toy” under the Creative Commons License at his site Drehkino.de (note the English link at the bottom of the sidebar). He offers readers the details to make it themselves and also provides kits with everything included. Very helpful was the service of shapeways inspecting the files you send them and point you on possible production problems and give you the chance of fixing it instead of printing garbage. Shapeways returned my file two times as not printable because of too high detail level (fingers) or small wall width (legs). The third file finally passed and the pictures and videos on this site show the result. It is solid but fragile and can be easily broken, so just look don’t touch! Thanks to the ball bearing the wooden base disk just needs a gentle initial turn. The applications of 3D printers are endless. From prototypes to dentistry to blood vessels and now to Zoetropes, 3D printing technology is going to rock your world.